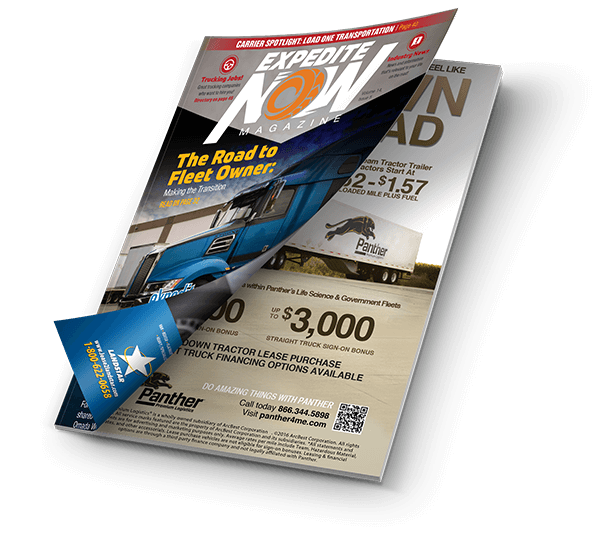 Expedite Now had the change to speak with Stephen Halsted and Sandy Goche, owner operators leased to V3 Transportation in Brunswick, Ohio. Sandy was born and raised on a farm in north central Iowa. She is a collector of fine writing instruments (fountain pens, ball points, and mechanical pencils). Stephen is a military brat and has been all over. His hobby is trying to keep Sandy happy at all times. The driving community may know them for their brimmed hat collection. They team drive, with Sandy taking the daylight hours and Stephen driving the night time hours. The 2016 Freightliner truck was assembled from various vendors, spearheaded by Jeff Jones at Stoops. The truck features a custom 100” sleeper built by the good folks at Bolt Custom Trucks. The sleeper contains an ice cream freezer, embroidered small mouth bass on the underbelly of the bunk, hat racks above the visor and a Bose sound system. The graphics were installed by Greg at Signs In Time. Stephen has been doing expediting for almost four years. He found his way into expediting after being laid off from his computer job and talked to Paul, a friend from Appointments, Sandy’s favorite writing instrument store. Sandy has now been in the truck and driving for four months after receiving treatment for colon cancer. What tools, smart phone apps or software do you use to help you on the road or run your trucking business? We use Trucker Path, TruckSmart Pilot, Blue Beacon, FleetAdvance, TRANSFLO Mobile+, Walmart and Google Maps as our most frequent apps. We also use MS Word and Excel for our business software, and Sandy spends way too much time on Facebook keeping her ex-coworkers informed of her travels. Why did you choose time sensitive, expedited freight? Do your research before getting into expediting. Talk to those who are in the business. This can be accomplished by going to truck shows. In particular, the Expedite Expo would be highly recommended. You can also do some research online and ask questions on the trucking forums. Expediters Online would be one of the first places to check out. Tell us about a great load experience or experience on the road. Every day is a new adventure in the truck. The most recent interesting experience was picking up the BIG 10 football championship paraphernalia in Detroit Lakes, MN. We had to wait for the game to finish to find out whether we were going to Iowa City, IA or East Lansing, MI all the while driving to pick up the merchandise. There was family rivalry involved too, with Sandy rooting for Iowa while her sister was pulling for Michigan State. How long have you been with V3? Stephen has been driving for V3 since December 2013 as a solo. Sandy joined him in the truck in November 2015 to form a team. Why did you choose to run for V3? We chose V3 based upon the family atmosphere.You are not a truck number, you are a person. We also got the no-holds barred story about how it works at V3 from our recruiter, Patricia Wells. V3 accepted Sandy with no driving experience since Stephen was going to be in the truck with her. What advice would you give to someone who is considering finding a new carrier to haul for? We would recommend that you do the same work that you would if you were just getting into the business. Plus, get the names of current drivers that work for the carrier to give them a call. This is where your networking skills will come in handy. Thank you for your time. It’s been our pleasure, any other thoughts that you’d like to share with our readers? If you are getting into expediting to see this beautiful country, you certainly will. However, you also need to take care of business while doing it. 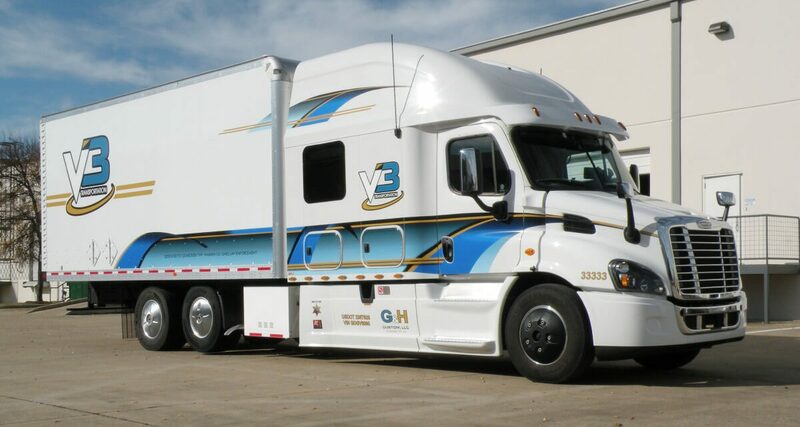 Click or Call today for more information about the benefits of leasing to V3 Transportation!V3transportation.com 888.216.9671.